Is learning to fly something you've often thought about? Each year thousands of people in the United States begin flight training to learn how to fly general aviation airplanes. 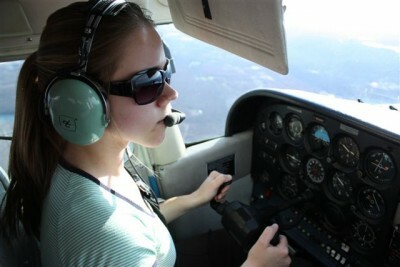 You too can experience the freedom and joy of flight, and the pride of earning a pilot’s certificate. Although the average student pilot is 30 years old, people of all ages, from every occupation and every geographic location around the world are pilots. They come from all walks of life and have a variety of reasons for wanting to learn to fly. Some fly to expand business opportunities, others to explore careers in the aviation industry. Some are looking for an activity they can share with their family. Most fly just for the fun of it! Flying is also very efficient. Many trips that normally take a whole day by car can be made in less than half the time by airplane. Piloting your own plane also increases the number of destinations you can reach directly by air. In the United States, about 650 airports serve commercial airlines, but more than 12,000 airports are open to general aviation pilots. Century Air has been in operation since 1975, during which time we have given thousands of pilots the structured and high quality training necessary to achieve their aviation goals, from private pilot to commercial and airline transport pilot (flying for the major airlines). The opportunity to learn in a structured academic environment is one of the many reasons Century Air stands above the rest as an exceptional flight training school. Whether your desire to fly is for personal pleasure, or to become a professional pilot, Century Air offers quality educational facilities, the most experienced and highly trained staff and the finest flight training programs available in general aviation today. Contact us for more information and become a member of our aviation community. You’ll soon join the thousands of pilots who have achieved their aviation goals and have taken off for the skies.